The Ottawa Paramedic Service is still falling short of a council-set benchmark for how long it should take to respond to life-threatening emergencies. Council received the Ottawa paramedic 2016 annual report without question or comment Sept. 13, 2017. 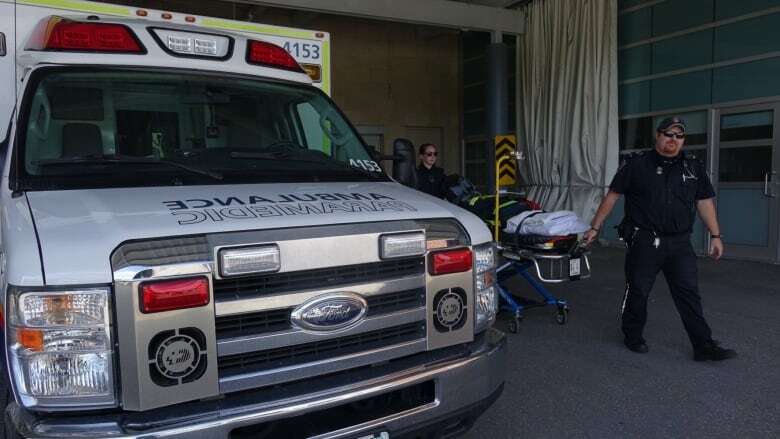 Despite a small improvement, the Ottawa Paramedic Service is still falling short of a council-set benchmark for how long it should take to respond to life-threatening emergencies, according to the service's 2016 annual report. The provincially-legislated response time for life-threatening calls is eight minutes from the first unit being notified of the call for service to a paramedic arriving on the scene. The City of Ottawa has set a benchmark that paramedics meet that target 75 per cent of the time. In 2016, the service's response time performance was 73.2 per cent, a slight uptick from the previous year when it was 72.5 per cent. However, the paramedic service's performance has dropped 10 percentage points since 2013. Coun. Eli El-Chantiry has called for the city to speed up the hiring of paramedics to deal with shortages in the past. "We're going in the right direction," El-Chantiry told CBC News. Ottawa city council approved the hiring of 12 paramedics in 2016 and another 24 this year, plus the addition of one ambulance. Pending budget approval, the city will acquire another ambulance and hire 14 more paramedics next year. "Our residents live longer. We're encouraging people to stay at home [instead of going to long-term care homes]. In the future this is going to create more [pressure] on the system than less." There has already been a 14 per cent increase in calls since 2012, according to the report, which was released Thursday. Darryl Wilton, the president of Professional Paramedic Association of Ottawa, said that increase has put a strain on resources. Paramedics responded to approximately 138,000 calls in 2016, Wilton said — and that number is expected to be even higher at the end of 2017. "The frequency of our level zero alarms is increasing," Wilton said. " And we also know we're having a little bit of trouble meeting our response times." "Level zero" alarms occur when there are no ambulances available to transport patients. CBC News has learned there were 250 such alarms in 2016. Canada 150 events have also increased demands on the service, and that will create a "blip" in the data, making it more challenging to plan for the future, Wilton said. Life-threatening calls made up 1.2 per cent of calls in 2016, according to the report. It also said that paramedics met their council-set benchmarks on responses to urgent and less urgent calls. One factor that has helped keep response time performance from declining further is innovation on the part of the service, Wilton said — specifically, rapid response units that use cars and bikes, rather than ambulances to respond to calls. Wilton said those paramedics can assess, treat and even release patients before they need to be taken to hospital, freeing up ambulances to deal with more serious cases. "What you've seen there is it's kind of plateaued, where we have enough rapid response units throughout the community ... we have to start looking at [whether] we have enough [ambulances] to transport people to hospital."